Today was Cinco de Mayo (El Día de la Batalla de Puebla). For those unfamiliar with Cinco de Mayo, it’s not Mexican Independence Day. It commemorates the Battle of Puebla where the much more poorly equipped Mexican army of 4,000 crushed the 8,000 strong French army as France was trying to expand the French Empire into Latin America. Despite Mexico being finally conquered by France, Cinco de Mayo is still celebrated today. It is observed in the United States as a celebration of Mexican heritage and pride and to commemorate the cause of freedom and democracy during the first years of the American Civil War. Because today was Cinco de Mayo we had to fix Mexican food, kinda sorta. So we did these wonderful roasted rellenos with Spanish rice, Baby Lady’s wonderful guacamole, and homemade Margaritas. It was a wonderful meal. While traditional rellenos are dipped in egg batter and fried, we try to avoid fried foods. So, we decided roasted chiles is the way to go. Roasting the chiles give them a wonderful depth of flavor and a little smokiness from the grill. 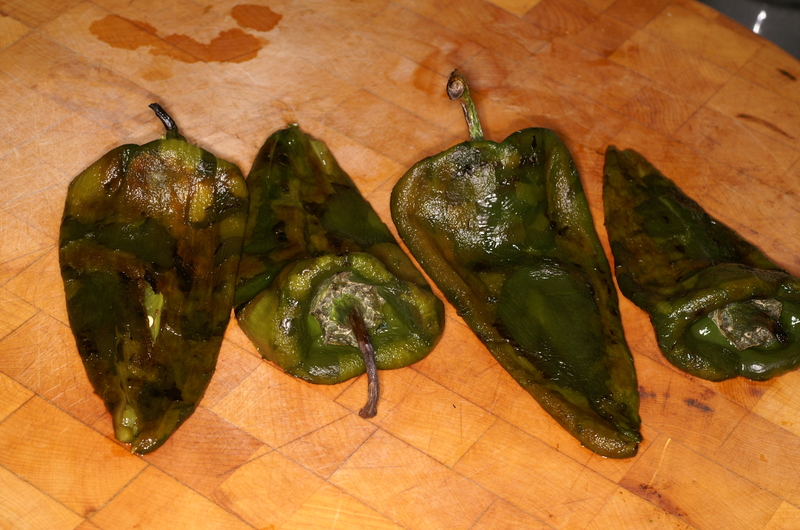 We then slit the chiles, stuff them however we like, bake them to heat through and serve them with rice. This is a whole lot more healthy, less messy and pretty quick. Give these a try. I’m sure you will like them. Roast the Poblanos until charred all around. 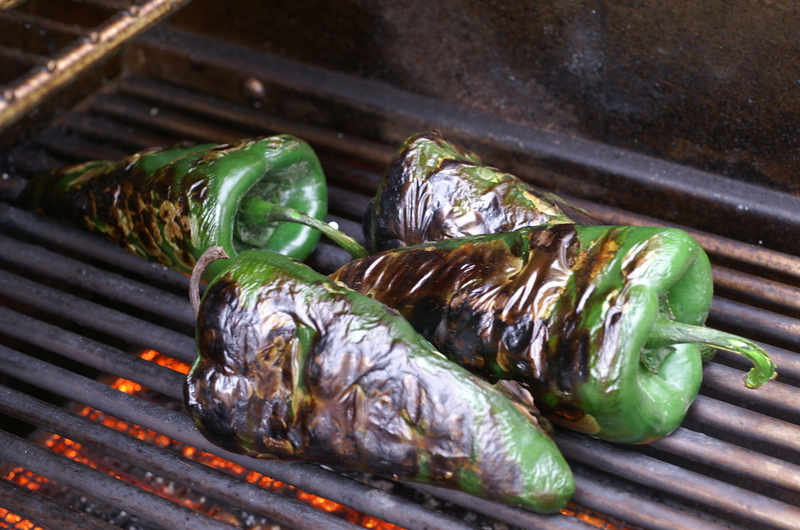 Place roasted poblano chiles in a paper bag and crimp. When cooled peel the peppers and set aside. Do not rinse the peppers as it washes much of the flavor away. Add oil to hot Chef’s pan. Add onions and sweat over high heat. Reduce heat to medium and add garlic and Serrano chiles and cook 2-3 minutes. 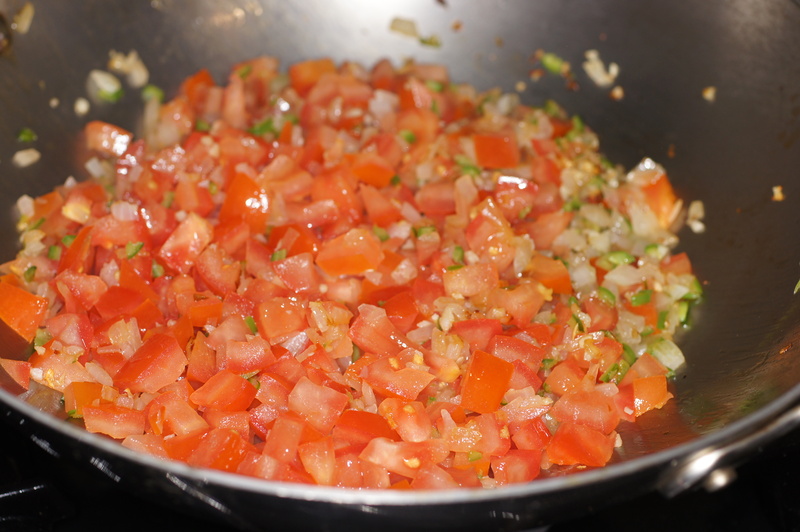 Add diced tomatoes, 1/4 cup white wine (preferably Chardonnay) and cook for another 3 minutes to break down the tomatoes. 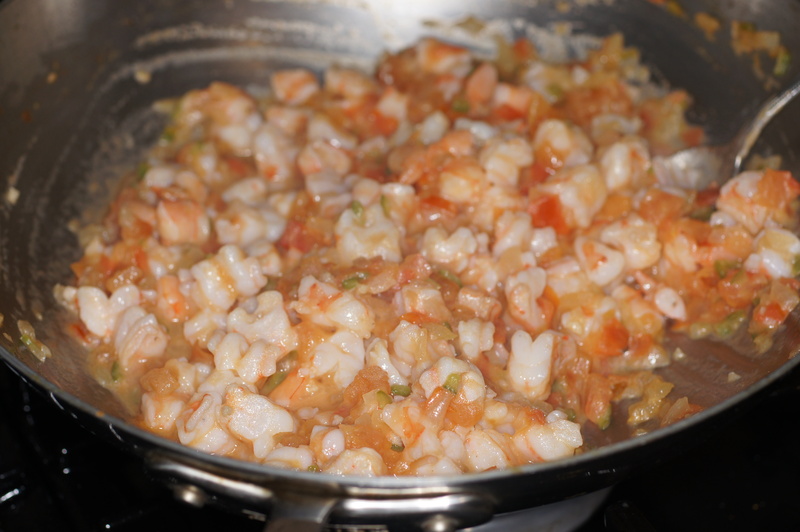 Add Shrimp and cook 2-3 minutes or until just underdone. 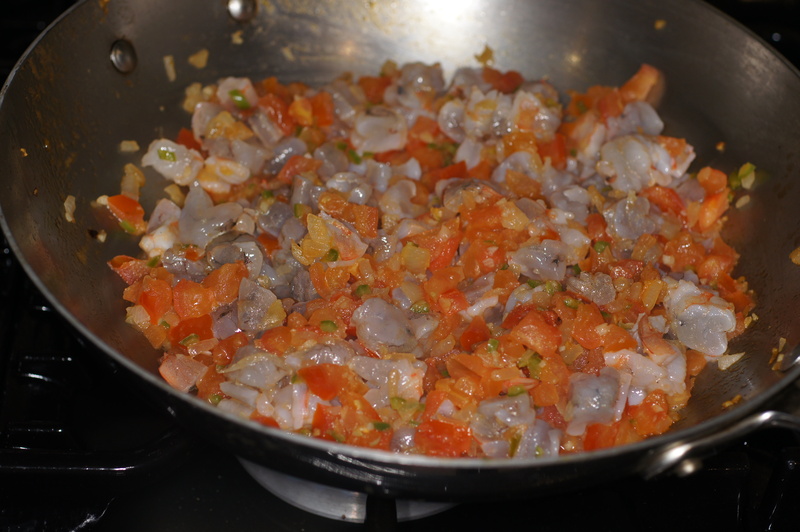 Add 2 Tablespoons of sauce and stir to incorporate. Slit and seed the peppers. Stuff peppers with the shrimp stuffing. Lightly oil a casserole pan and place the Poblano files in the casserole pan. Put in 350 F oven for 15 minutes to heat through. 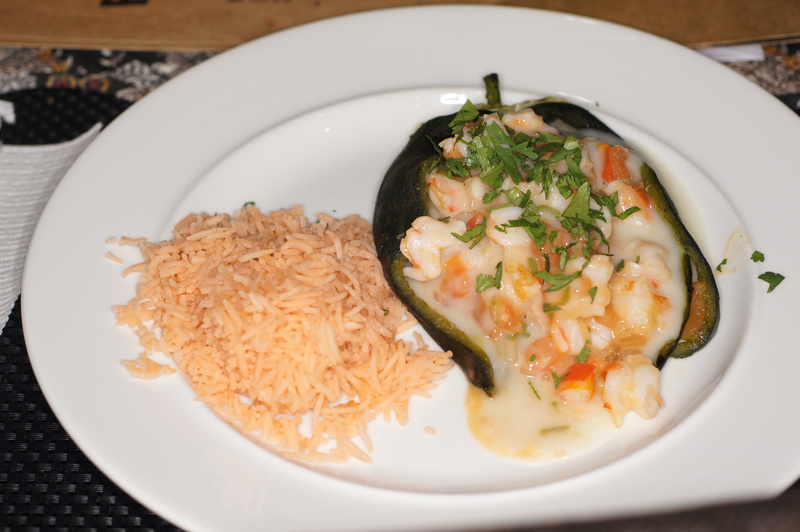 Place Poblano chile on plate with rice. 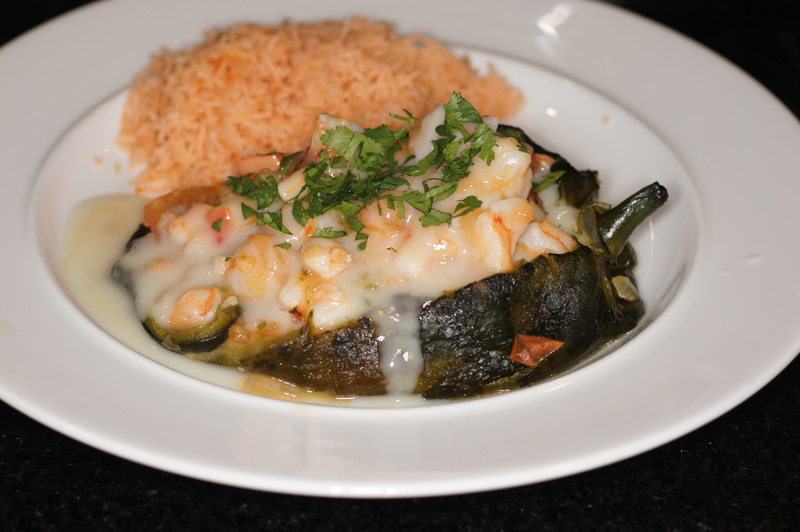 Spoon 3 Tablespoons of sauce over each Poblano and sprinkle with chopped cilantro for garnish. Serve & enjoy. Love this recipe. 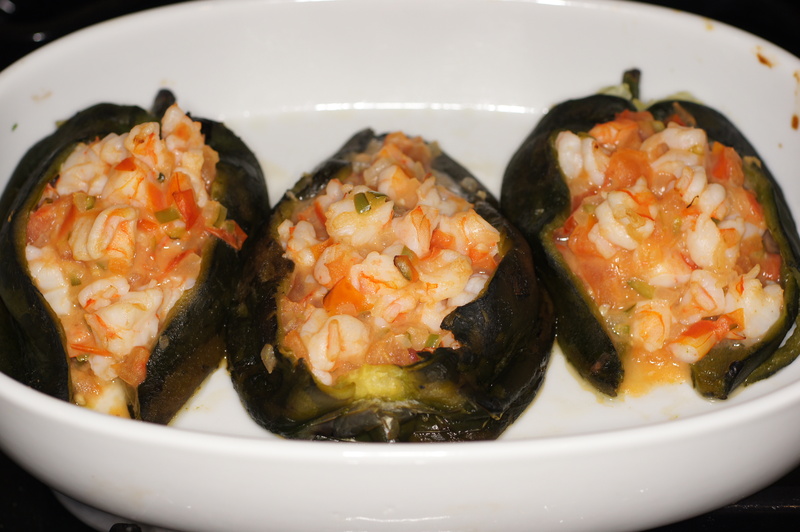 I often make chiles rellenos that are not batter-dipped and fired. As you probably know, there are almost as many chile relleno recipes as there are abuelitas! 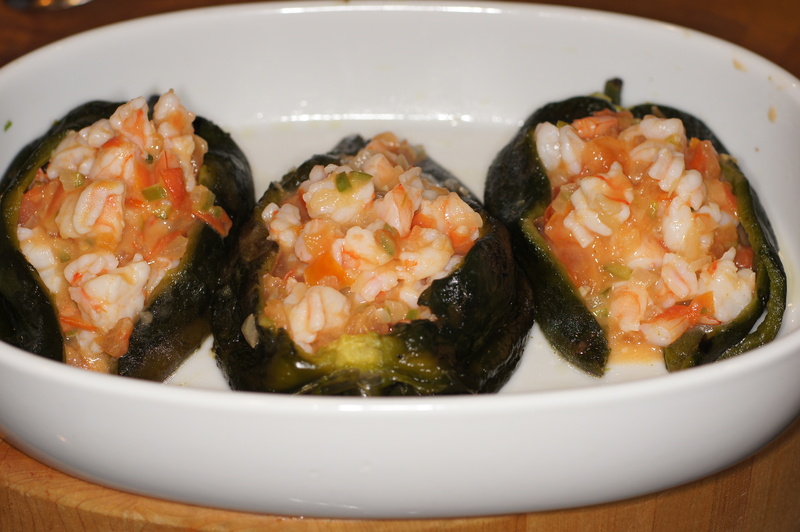 :D. Yep, there are lots of relleno recipes. I just love them but I love chiles. There simply is nothing like them. oops, that’s “fried”, not “fired”. I have a chiles en nogada recipe, see: http://www.examiner.com/…/celebrate-mexican-independence-with-chiles (btw, this a great if you want to sub wild rice for the ground beef). Provecho! The link is broken. I would love to check out your recipe if you can fix it. I also liked your interview with Aaron Sanchez. Really nice recipe. it goes in the recipes to try list. Oooo…beautiful. Love the shrimp. I did not cooking today. We just went to a Cinco de Mayo fair and there was so much yummy street food. I really enjoyed the mangos on a stick with chili powder. You make me laugh. Margaritas always make an impact and are sooo good. I’ll forgive you this time. 😉 Glad you got to take a day off and enjoyed the beautiful street food. We went to the Fort Worth Main Street Art Festival a few weeks ago and did the same thing. I love good street food. I can’t wait to try this. I am on a shrimp kick lately, and everything about this dish looks amazing! Thanks for your nice comment. You are always very kind. Let me know how you like it. I really like the cilantro cream sauce. It’s very delicate and accents the flavors ever so nicely.